The Stewards in Goshen with their household staff, ca. 1857. Jackson Steward is seated, reading a letter, and Rachel and Camille Marié can be seen in the doorway. I’m not sure when I first realized that, in addition to my direct ancestors’ propensity for marrying their cousins, I had collateral relatives who were wont to marry into the same families. The examples are extensive enough that it might take a couple of posts to cover the territory, so for this one I will look at my paternal grandfather’s Steward relatives – I can think of four instances without too much trouble! My great-great-great-grandfather John Steward of Goshen, New York (1777–1854) was married twice, first to a neighbor, Martha Jackson, and then to Mary Isabella Young of Philadelphia. By his first wife, John had five children, four of whom lived to grow up and marry; poor Mary Isabella had just one survivor among her children. Sad to say, too, that all of John Steward’s daughters died comparatively young, while his two elder sons lived to ripe old ages. The first child to marry was the eldest daughter, Elizabeth (1812–1843), to John Slosson; one of the last was Mary Isabella Steward’s daughter, Rachel (1829–1865), who married Camille Marié in 1856. As Elizabeth (Steward) Slosson married in 1833, there was plenty of time for her to have a daughter, Sarah Elizabeth Slosson, who married Uncle Camille’s brother Albin in 1857! The only child of this marriage was (Léontine) Elizabeth Marié, who married (Robert) Morgan Gibbes Barnwell in 1883; their surviving child was named Clermont Livingston Barnwell. Mary Bogert Steward designed this house for her cousin, my great-grandfather. John and Martha’s younger son, Daniel Jackson Steward (1816–1898), waited until he was forty to marry. 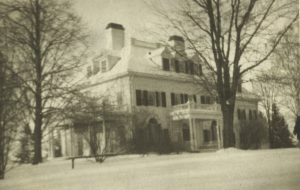 His wife was Mary Anna Bogert (1830–1912), and they had four daughters, among them Mary Bogert Steward (1860–1955), who designed my great-grandparents’ house in Goshen, and Elizabeth, who married Drayton Burrill. 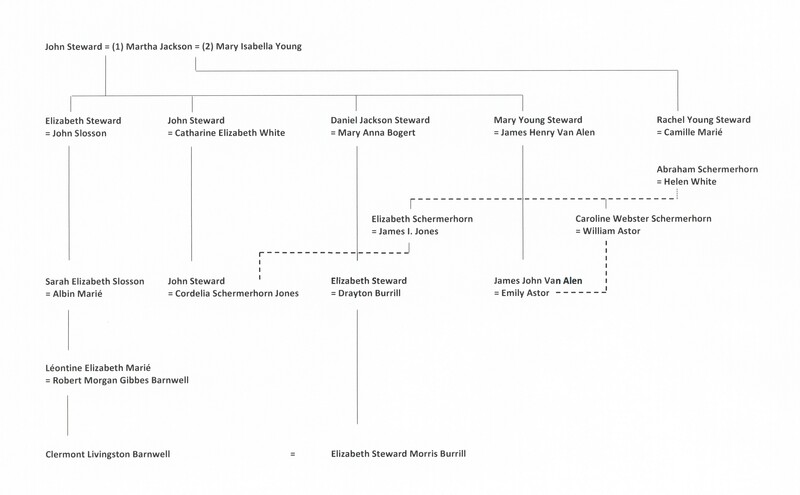 Here everything comes together, for Elizabeth (Steward) Burrill had a daughter, Elizabeth Steward Morris Burrill (1895–1985), who married her cousin Clermont Livingston Barnwell in 1917. But we aren’t finished! John and Martha’s younger daughter was Mary Young Steward (1818–1852), who married James Henry Van Alen in 1844; he would later serve as a Union general during the Civil War. The Van Alens’ only child was James John Van Alen (1846–1923), who married Emily Astor – the eldest daughter of Mr. and Mrs. William Astor and sister of John Jacob Astor, who went down with the Titanic – in 1876. [Two] first cousins – James Van Alen and John Steward – married two first cousins – Emily Astor and Cordelia Jones. My great-grandfather, Campbell Steward (1852–1936), was James Van Alen’s first cousin, the son of John Steward (1814–1901) and Catharine Elizabeth White. His older brother, also John Steward (1847–1923), married Emily Astor’s first cousin, Cordelia Schermerhorn Jones, in 1871. So two first cousins – James Van Alen and John Steward – married two first cousins – Emily Astor and Cordelia Jones. Relations between the two families were such that, I remember reading, the young Van Alens named their joint cousins John and Cordelia Steward as the contingent guardians for their children Mary, James, and Sarah. Which brings me to my fourth connection. Several years ago a Van Alen kinsman (descended from James John Van Alen and Emily Astor, and thus a cousin through the Stewards and a connection through the Schermerhorns, Aunt Cordelia’s ancestors) married my stepsister, a Steward – only 166 years after the last Steward/Van Alen wedding … or 139 years since the last Steward/Schermerhorn union! Great cousin story. The photograph is intriguing. Do you know anything about the African American family? Were the Stewards active in anti slavery issues of the time? Scott, this is one of the families in which, if you’re in it, it’s all very clear; if you’re not, you need a road map. I, too, was drawn to the beautifully composed family portrait featured at the beginning of your article. I was also wondering if your genealogical research of the Steward family has extended to the “household staff” pictured in that photograph? 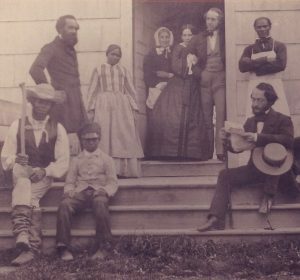 Since slavery was not abolished in New York State until 1827, it’s probable some of the adults pictured were enslaved thirty years earlier. Do you know if any of the individuals pictured were included in the book, “Genealogical History of Black Families in Orange County,” by Robert Brennan? Some of my collateral kin (Loomer-Horton) passed through Goshen on their way to Minnesota. Wonderful photograph of the family – all prosperous and happy. Love to know what that letter said! The first post (https://vitabrevis.americanancestors.org/2014/11/all-far-from-goshen-three-family-photos/) gives some background on the Stewards and related families, all gathered together at some date during the 1850s. The second (https://vitabrevis.americanancestors.org/2015/08/a-letter-from-home/) covers my great-grandfather’s relationship with Silvester Jervis — even when separated, the households remained in close touch. The last (https://vitabrevis.americanancestors.org/2016/04/solving-a-mystery/) goes into further detail about a couple of the servants, clearly regarded fondly by my great-grandfather’s generation, as these images came down to my grandfather and then to me. I have not seen the book on black families of Orange County — it sounds like it would really help sort out who was who in these photos! My sympathies, Scott! In my own tree, three Cornwell daus of a many times ggm married three of the Weaver sons of one of her sisters. The children of these Cornwell-Weaver unions went on to marry their first cousins for a couple more generations. To enter or amend the records of their descendants, I place a large bottle of Excedrin next to the computer in anticipation of the headache which will be the result of the pressure to not screw up. To do so, I know from past experience, will require days to repair even the tiniest mistake. Even if every entry or change is accurate, the relationship calculator literally groans as it calcs or re-calcs how each entry relates to me, the only branch of the tree this happens. Instead of “normal” results like “great-aunt” and “husband of gr-aunt”, the wife might be my gr-gr-aunt and hubby my 3C4R, or something equally unconventional. Whenever I find a “new” Weaver in certain areas now, I’ve no doubt we’re related, but have no desire to find out how! Mr. Steward, I was intrigued about Clermont Livingston Barnwell. I am a direct descendant of the first Livingstons in America. Clermont must be named for his great grandmother, Margaret Livingston.